During the 2009 Icelandic Kitchenware Revolution. Wikimedia Commons/OddurBen. Some rights reserved. Iceland earned the respect of many observers of democracy around the world when, after the financial crash of 2008, its parliament decided to go back to basics and revise the country‘s constitution. A constitutional overhaul was long overdue. For nearly 70 years, Iceland’s political class had repeatedly promised and failed to revise the provisional constitution of 1944, which was drawn up in haste with minimal adjustment of the 1874 constitution as part of Iceland’s declaration of independence from Nazi-occupied Denmark. Clearly, the 1944 constitution had not prevented the executive overreach and cronyism that paved the way for the corrupt privatization of the Icelandic banks from 1998 to 2003 - and their subsequent crash a few years later. 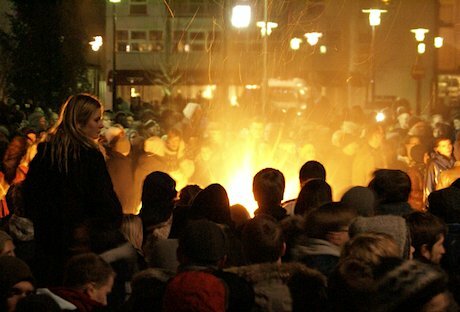 Faced by pots- and pans-banging crowds in Parliament Square in Reykjavík in late 2008 and early 2009, the politicians admitted failure, accepting the protesters’ demands for, among other things, a new constitution. The new post-crash government that came to office in early 2009 – the first majority government to include neither the centre-right Independence Party nor the agrarian Progressive Party – decided to break new ground by asking the people, not the politicians, to draft a new constitution. To this end, the parliament appointed a constitutional committee of seven to prepare the ground and organize a national assembly comprising 950 individuals drawn at random from the national registry. The national assembly, organized in 2010 in accordance with the notion of Collective Intelligence, concluded after a day’s deliberations in November that a new constitution was called for and ought to contain certain key provisions concerning, e.g., electoral reform and the ownership of natural resources, for a long time two of the most contentious political issues in Iceland. In October of that year, the government also held a national election to a constituent assembly to which 25 individuals were elected from a roster of 522 candidates from all walks of life, most of them with no particular political or special interest affiliations. With the constituent assembly about to start its work in early 2011, some opposition politicians could not conceal their displeasure. The conclusion of the national assembly constituted an unequivocal appeal for the revocation of privileges – e.g., the privileges of those who benefit from unequal access to the country’s common-property natural resources as well as from unequal voting rights. Understandably, the prospect of 25 individuals over whom the political parties had no control being about to begin their work guided by a legal mandate to revise the constitution in broad accord with the conclusions of the national assembly made some politicians uneasy. What happened next? Three individuals with documented connections to the Independence Party, Iceland’s largest political party until the crash of 2008, filed a bizarre technical complaint about the way the election to the constituent assembly had been conducted. On the basis of these complaints, six Supreme Court justices, five of whom had been appointed by successive ministers of justice from the Independence Party, declared the election null and void - even if no one had ever claimed that the results of the election were at all affected by the alleged technical flaws. Never before had a national election in a fully fledged democracy been invalidated on technical grounds. The parliament reacted to the ruling by appointing the 25 representatives who had received the most votes to a constitutional council, thereby changing a popularly elected assembly into one appointed by parliament. The opponents of constitutional change celebrated victory and thereafter used every opportunity to undermine the creditworthiness of the council. The opposition was not confined to the Independence Party. The Progressives, who had previously expressed strong support for a new constitution, changed course and joined the opposition to reform. Even within the new governing coalition of the Social Democratic Alliance and the Left-Green Movement, there were pockets of passive resistance to change as well as among some academics apparently disappointed that they had not been asked to rewrite the constitution. Whence the fierce opposition to constitutional reform? The chief opponents were the usual suspects: the political allies of special interest groups such as the fishing vessel owners whom the politicians had turned into a state within the state through gratis, or practically gratis, allocation of valuable fishing licenses. The opposition also came from politicians who would not stand much chance of being reelected to parliament under the principle of ‘one person, one vote' (as the current system requires much more votes to be elected as an MP in Reykjavik than in one of the more rural areas). Indeed, constitutionally protected national ownership of natural resources and electoral reform to ensure ’one person, one vote’ were the two principal hallmarks of the bill. But the constitutional council paid no attention to any of this. Within four months, it produced a constitutional bill incorporating virtually all the conclusions of the national assembly, and approved the bill unanimously by 25 votes to zero, no abstentions, and delivered the bill to parliament in mid-2011. In the course of preparing the bill, the council sought and received the advice of numerous experts in different areas as well as from ordinary citizens who were invited to offer their comments and suggestions on the council’s interactive website. Representatives of special interest groups, unused to not being invited to exclusive legislative meetings, did not respond to this open invitation to the public. After the bill was completed, they could not rightly complain that they had not been consulted. After delivering the bill to parliament, the constitutional council disbanded. The parliament took over, seeking further comments from local lawyers as well as, ultimately, from the Venice Commission. The parliament was encouraged to translate the bill into English so as to be able to solicit foreign expert opinion, but failed to respond. Instead, a translation was arranged and paid for by the Constitutional Society, a private nonprofit organization. This translation made it possible for world-renowned constitutional experts such as Prof. Jon Elster from Columbia University and Prof. Tom Ginsburg from the University of Chicago to express their helpful views of the bill. The bill was brought to a national referendum in late 2012. Initially, the parliament intended the referendum to coincide with the presidential election in June 2012 to secure a good turnout, but the opposition Independence Party and Progressive Party resorted to filibuster to thwart this plan, holding parliament hostage for days and weeks on end. At the same time, they complained about not having enough time to consider the bill – which was, of course, largely due to their reluctance to accept and follow the constitutional process. When the Independence Party leader was reminded of the classic example of chutzpah (this is when you murder your parents and ask for mercy on the grounds that you are an orphan), he complained about being unfairly likened to a murderer. Nevertheless, the referendum was delayed until October 2012. Voter turnout was 49 percent. No less than 67 percent of the electorate declared their support for the bill as well as for its key individual provisions such as national ownership of natural resources (83 percent said Yes) and equal voting rights, meaning one person, one vote (67 percent said Yes). By inviting the voters to accept or reject the bill in toto (specifically, the first question on the ballot was: “Do you want the proposals of the Constitutional Council to form the basis of a legislative bill for a new Constitution?") as well as its key individual provisions, the parliamentary majority was able to say to the bill’s opponents: Look, the voters support both the bill as a whole and its key provisions. In view of the results, parliament decided to suggest only changes of wording where considered necessary and to abstain from substantive changes (except concerning the church where the voters did not accept the formulation in the bill). The people had spoken. The path forward, however, proved tricky. Three of the seven members of the constitutional committee which had been fairly unanimous in its work criticized the bill, unmoved by the result of the referendum, conducting themselves ex post like agents of the parliamentary opposition to the bill. The majority of four is known to support the bill and to respect the result of the referendum. A committee of lawyers asked by parliament to suggest only changes of wording went beyond its mandate by, among other things, suggesting substantive changes to the natural resource clause in a poorly disguised attempt to thwart the intent of the constitutional council and the will of the voters as expressed in the referendum. The council had made it clear in its proposed constitutional provision as well as in its supporting documents that the allocation of fishing quotas does not bestow on the recipients of such allocations any private property rights to the common-property resources. To its credit, the parliamentary committee in charge restored the council’s original formulation. There was no dearth of academic viewpoints on the council as five of its 25 members were professors and three others were junior academics. But unlike the many academic experts who generously offered their help and advice to the council during its four months of intensive work in 2011, a few others were less forthcoming. It was only after the October 2012 referendum that some of the unsupportive academics stepped forward with critical comments on the bill, presented in newspaper articles and television interviews as well as at a series of conferences organized by some universities. The criticism offered was generally of low quality on top of being late, reflecting personal opinions rather than academic research as well as total disregard for the timetable laid down by parliament. In a newspaper interview, after the referendum, one professor called the council “completely illegitimate,” adding that “a certain elite” (presumably including himself) should rewrite the constitution. The poor timing of this late criticism is noteworthy because the Alliance for a New Constitution, a private association established to explain the constitutional bill to the voters before the referendum, had written to the rectors of the universities ahead of the referendum, asking them to encourage their experts to contribute to public debate on the bill. Their reaction appeared only after the referendum. It seems that the dissenting academics hoped the bill would be rejected in the referendum and thought it unnecessary to discuss it. A month after the referendum, parliament at last asked the Venice Commission for its reaction to the bill. In record time, Venice produced a draft report with various suggestions, several of which the relevant parliamentary committee decided to incorporate into the bill. The bill was now ready for a final vote in parliament. A majority of 32 MPs out of 63 declared in public and in writing that they supported the bill and wanted it passed before parliament was dissolved in time for the April election. Based on earlier related votes in parliament, it seemed likely that only fifteen or twenty MPs would vote against the bill; the October 2012 referendum was approved by 35 votes against fifteen, with thirteen abstentions. Victory seemed assured. Or was it? The main opposition parties, the Independence Party and the Progressives, threatened a final act of filibuster, a tactic they had used successfully to delay the 2012 referendum and to derail and destroy various other legislative initiatives of the government. (In a telling comparison, one pro-constitution bill MP likened her attempts to get work done in parliament to trying to file her income tax return with monkeys at the kitchen table.) The government majority behind the bill, including a small opposition party, the Movement, did have the legislative means to stop the filibuster to prevent time from running out but they were reluctant to do so, even if it was clear that failing to do so would kill the bill. I received advance warnings from MPs that the bill would not be passed; “I smell sulfur,” one MP wrote to me. Some council members with good connections to parliament had warned all along that parliamentary support for the bill was rather weak. The strategy of the Alliance for a New Constitution was to force the issue into the open. We understood from the outset that in a secret ballot the bill might fail in parliament; after all, rising against the fishing vessel owners in Iceland has been described as “suicide” for rural MPs. Parliament does not vote in secret, however, and this was key. In an attempt to ensure that the constitutional bill would have to be brought to a vote, Margrét Tryggvadóttir MP presented the bill put forward by the parliamentary committee in charge (of which she was a member) as an amendment to another related last-minute bill. But the president of the parliament put the last-minute bill to a vote without first presenting the amendment, thereby failing to bring the constitutional bill to a vote, in violation of parliamentary procedure. This happened at 2 A.M. on the morning of the last session of parliament before recess. The enemies of constitutional reform carried the day and democracy was put on ice. The government blamed the misbehaving opposition for the debacle, while the outgoing prime minister who had launched the process in 2009 said this was the saddest day of her 35 years in parliament. The April 2013 election produced a coalition government of the Independence Party and the Progressives, the two parties that privatized the banks à la Russe and set the stage for the crash of 2008. The parties represented in parliament hardly mentioned the constitution in the campaign; they wanted to avoid the subject. The Progressives won the election by promising instant household debt relief. In office, the first thing they did – surprise, surprise – was arrange instant tax relief for the vessel owners. It is clear that the two parties have no intention of reviving the constitutional bill. To them, it does not matter that 67 percent of the electorate expressed support for the bill and its key provisions. Further, they have decided to put Iceland’s 2009 application for EU membership on ice. Expect more ice to come. As always, however, there will be a new parliament after this one. One day, most probably, the constitutional bill approved by the people of Iceland in the 2012 referendum or a similar one will become the law of the land. Stay tuned. The 2010 assembly was modeled on a privately organized national assembly the year before.